RAVYN LENAE Unveils New EP – Spotlight Report "The Best Entertainment Website in Oz"
Acclaimed modern pop sensation Ravyn Lenae has released her much-anticipated new EP. Crush is available now at all digital music retailers and streaming services. Crush is Executive Produced by Steve Lacy (The Internet, Kendrick Lamar), who also joins Lenae on two of its five tracks including the vocal call-and-response, 4 Leaf Clover (track listing attached). The EP is highlighted by the sultry new single, Sticky – watch the video here. Pitchfork has listed the Crush EP as one of their 6 Albums Out Today You Should Listen To Now. 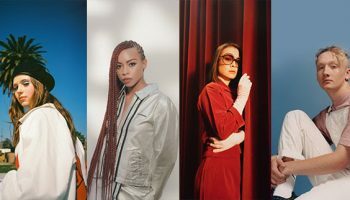 One of Billboard’s 2018’s R&B Class: Three Artists Poised For Breakout Success In 2018, Lenae is among the faces featured in Nike’s new The Force Is Female campaign. Acclaimed by Rolling Stone in its 10 New Artists You Need to Know: March 2017 for her “thoughtful and highly lyrical electronic soul,” Lenae made her label debut last year with Midnight Moonlight The EP – which has now amassing 16.5 million on-demand US streams – Includes the single, Unknown, joined by a companion visual directed by Weird Life Films (Joey Purp, Chance the Rapper).